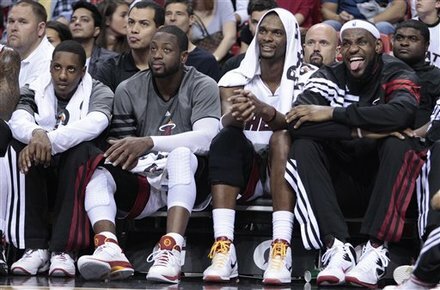 The Miami Heat beat the Charlotte Bobcats 129 to 90….Heat are now 5-0 for the FIRST TIME in Franchise HISTORY…. Dwyane Wade Breaks 14000 POINTS for his CAREER! What a NIGHT!! D-Wade grabs the ball and chucks to LeBron w/ the Quarterback Pass and REVERSE layup to finish it up….then LeBron returns the favor and drops back for the QB pass to Wade for the DUNK and to BREAK 14000 POINTS for his career!! Check out ALL the Highlights from last night against Charlotte at the AAA! Previous article Heat 4-0 – Beat Timberwolves 103 to 101 – Wade Game Winner x 2! !